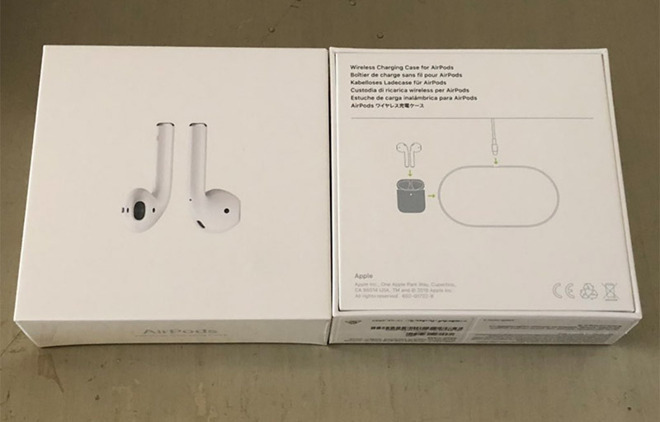 Seen above in a photo posted to Twitter by user Chris Caine, packaging included with the just-released AirPods with Wireless Charging Case features a line drawing that appears to depict AirPower. As is sometimes the case, early adopters are receiving their orders early and have subsequently posted glory shots to social media outlets. Like past Apple products, the box schematic serves as an instruction guide for using the device within, in this case charging AirPods on a wireless charger. The box urges users to insert AirPods into the provided Wireless Charging Case, then place the case on a wireless charger, which is connected to a power source via cable. While the model in the image is not specified, its outline bears a striking resemblance to Apple's fabled wireless charger. From its unique oblong shape to the Lightning connector interface, the pictured device is a dead ringer for AirPower. A separate photo of the new AirPods retail box was published by MacRumors today, suggesting the packaging is legitimate. This is not the first time Apple has hinted at a near-future AirPower launch. When iPhone XS launched last September, a simplified instruction manual included with the phone referenced the charger by name, sparking hope of an imminent launch. AirPower was unveiled in 2017 as an all-in-one power delivery solution for the company's portable device lineup. Initially slated to launch in 2018, the charger was reportedly delayed due to overheating issues. Just before last year's iPhone announcement, Apple scrubbed nearly all mention of AirPower from its site. While Apple has yet to comment on AirPower availability, rumors and speculation suggest the proprietary charging solution is in production and could hit store shelves in the near future. Last week, for example, a Twitter user discovered an updated photo of the device buried in code on Apple's Australian website. That image shows AirPower with a current-generation iPhone XS and AirPods Wireless Charging Case.